Has your Honda seen better days? Are you paying too much money to keep it on the road? It might be time to get rid of it. You can’t be blamed for thinking that the only way to do this will be to hire a company to haul it off to a landfill somewhere. But that junk or scrap Honda will just rot where it is if you do that, which isn’t good for the environment. And you have to pay money for the company that transports it there. If you contact us here at Wreck Monster, you won’t have to pay a dime. In fact, we will pay you for the junk vehicle. What’s more, it won’t rot in a landfill. The whole Honda will be recycled. How much will we pay for your Honda? It depends on the model and condition it is in, but you can be rest assured that relative to those variables we will pay you the most that it is worth. When we buy Utes, cars, trucks, vans, SUV’s and 4×4’s, we pay from $100 to $9999. Call us today at 0478 682 103 and get a free quote. We have a free quote form located on our website if you would prefer to use that, and we will be as quick as possible responding to it. Do we remove the scrap car for free? Yes, if your Honda is at the point where you want to sell it to a wrecking company, it would be safe to assume that you can’t drive it anywhere. We here at Wreck Monster will not make you pay for a company to transport it to our place of business. Instead, we will transport it there completely free of any cost or charge or nothing. We offer the same day removals through Sydney, NSW. We cover Penrith, Baulkham Hills, Richmond, Blacktown, Ultimo, Parramatta, Campbelltown & Liverpool. The model of Honda you have, makes no difference to the likelihood of us buying your Honda. This is another great feature of our wonderful wrecking company that needs to be spread as good news far and wide. The list of Honda Models we accept is as long as the list of Honda models that exist. So, whether you are the proud owner of a Crosstour, Spirior, Element, Stream, Logo, Partner, Accord Euro, Beat, Avancier, Insight, Passport, Life Duck, Edix, Rafaga, N600, S500, Ascot or Civic, you needn’t worry about whether we will buy it. 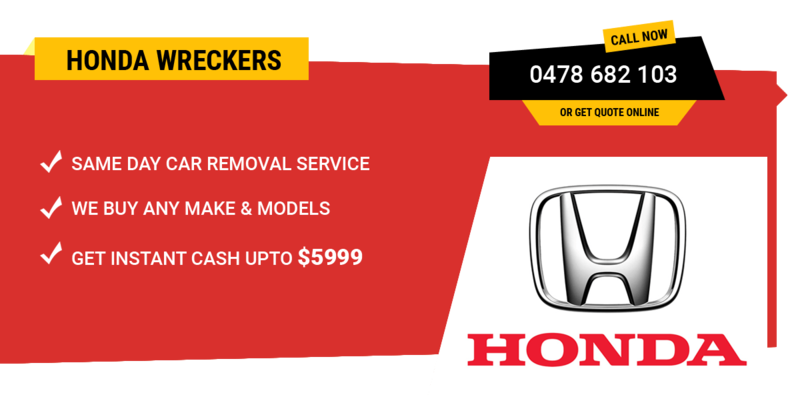 We will wreck, dismantle & recycle Hondas that are in any condition whatsoever. It doesn’t matter because we will be wrecking it any way. So, if you Honda has been totalled in a crash, has been damaged due to flood. Or is otherwise in terrible condition, you will have no trouble selling to us. As a superior Japanese wreckers, we have an enormous inventory of Honda parts due to the fact that we salvage parts from cars that we wreck. So if you need a part for your Honda look no further than Wreck Monster as we will have what you want at affordable prices and great value. The condition of all the parts is top notch. Don’t be shy, come on down to our shop, or call us at the previously mentioned number. Or contact us via the form on our website. Have a nice day!